Beautifully engraved Specimen certificate from the Popular, Inc. This historic document was printed by the American Banknote Company and has an ornate border around it with a vignette of the company name. 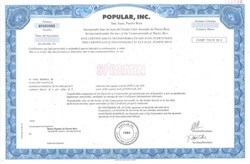 Popular, Inc. is the bank holding company for Banco Popular de Puerto Rico, the largest bank in the commonwealth. The bank has about 200 branches on the island, as well as about 30 branches in New York. Commercial, industrial, and agricultural loans make up about 45% of the bank's loan portfolio. The bank has subsidiaries active in vehicle leasing, small loans, and mortgage loans. Other subsidiaries include a mortgage and consumer finance organization active in around 30 US states and a firm that sells computer software in some 10 countries. Subsidiary Banco Popular North America has been expanding, serving growing Hispanic communities across the US.